Click each photo below to see a larger image and more information about the item. Used for making artificial teeth and other dental restorations, such as complete dentures, facings, inlays, veneer crowns and other bridge work. Manufactured by LD Caulk Company. 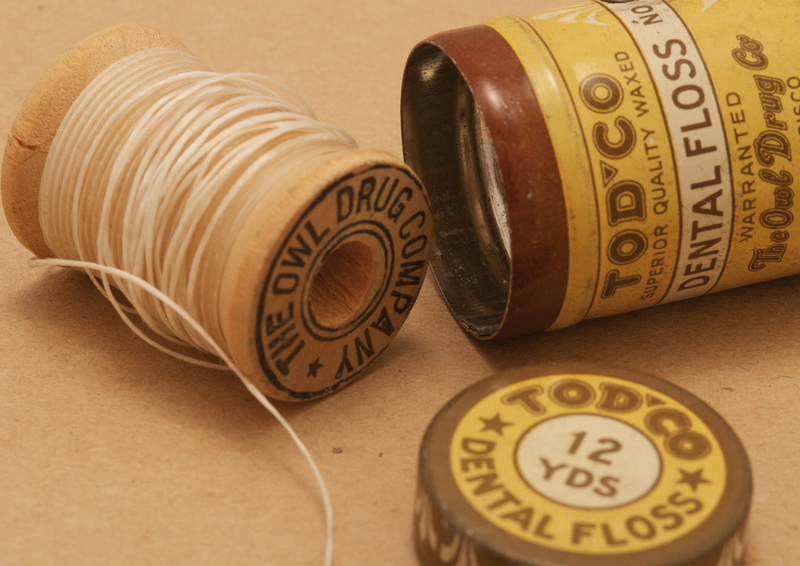 Silk dental floss. Manufactured by the Owl Drug Company, San Francisco and Los Angeles. 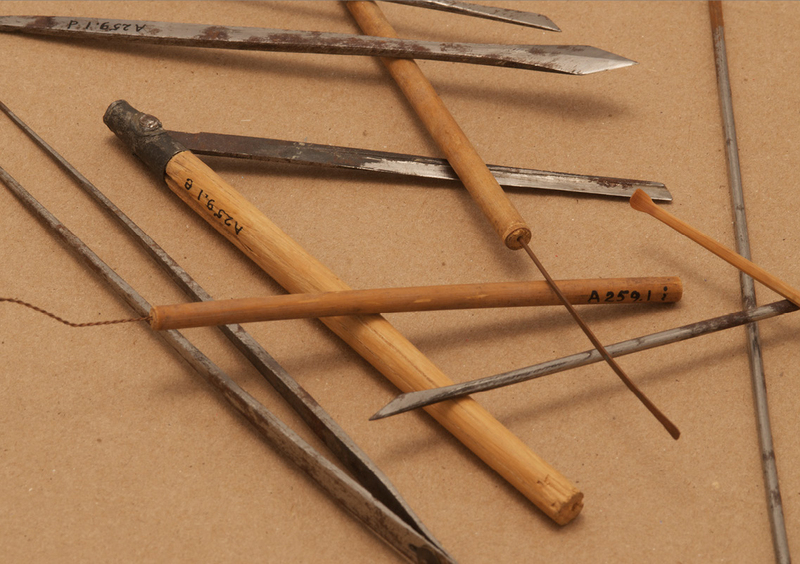 Used for repairing broken pin facings. Kit contains the drill, two taps, lead, finishing and gold screws. Manufactured by Columbus Dental Manufacturing Company. Apparatus used for taking the patient’s blood pressure. 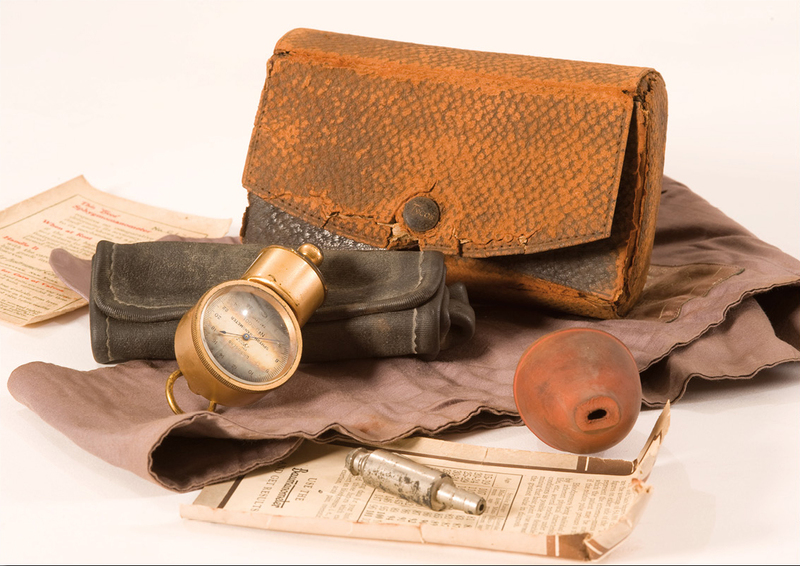 Includes blood pressure cuff, gauge, bulb, booklet and leather case. Manufactured by Taylor Instrument Company. 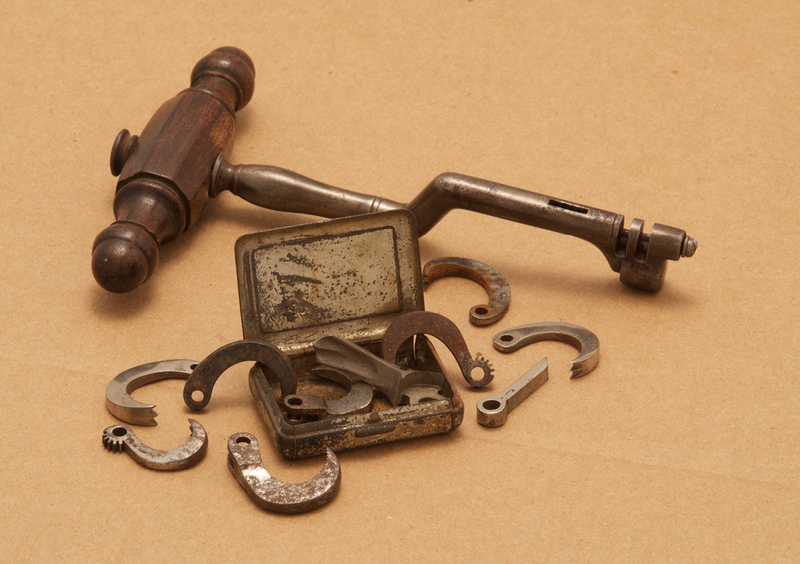 Also named a tooth key — after engaging the tooth inside the claw, rapid turning of the instrument, like a key in a lock, removed the tooth. Manufacturer unknown. 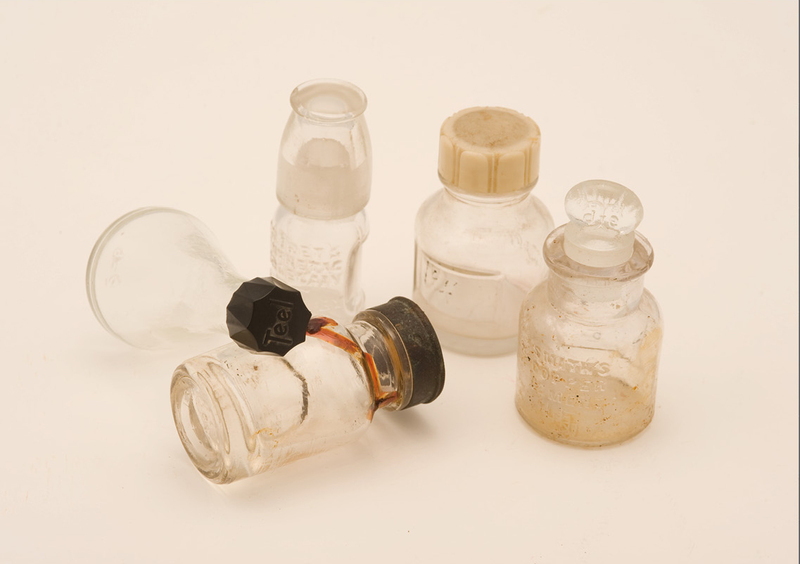 Far Left: Teel liquid dentifrice for cleaning teeth; Left: De Trey’s Synthetic Porcelain for making artificial teeth and other dental restorations; Center: Caulk Co., use unknown; Right: Caulk Co., use unknown; Far Right: Smith’s Copper Cement, a non-discoloring germicidal adhesive for setting general fillings, fillings for deciduous teeth, inlays, crowns and bridges. Purchased by Dr. Richard A. Bold while he served as medical director for the U.S. Indemnity College in Peking, China from 1910 to 1916. Lower left to upper right: Mixer blade, electric mixer, rubber mixing bowl; used to mix plaster for making models and taking impressions. Manufactured by Emerson Electric Company. 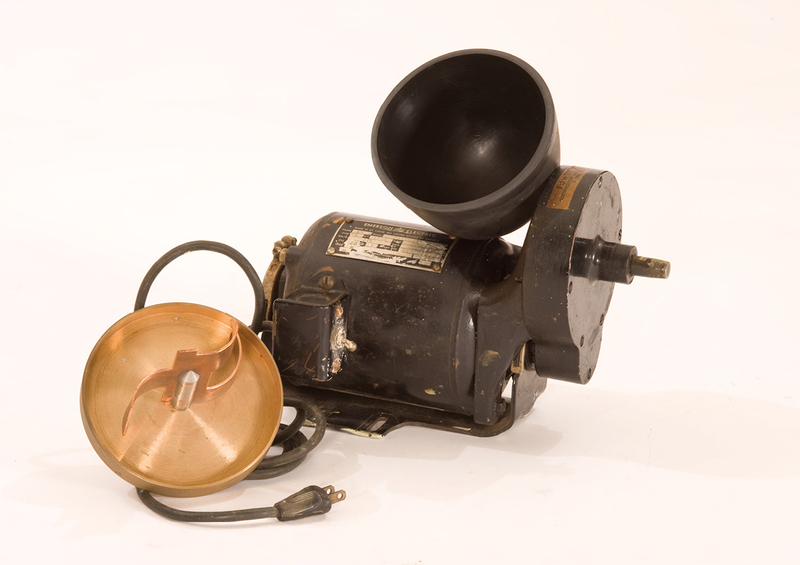 This mixer was owned by Dr. Fred West (P&S Class of 1917), who started teaching at P&S in 1919, and was Ortho Department Chair and UOP Regent from 1962 to 1983. 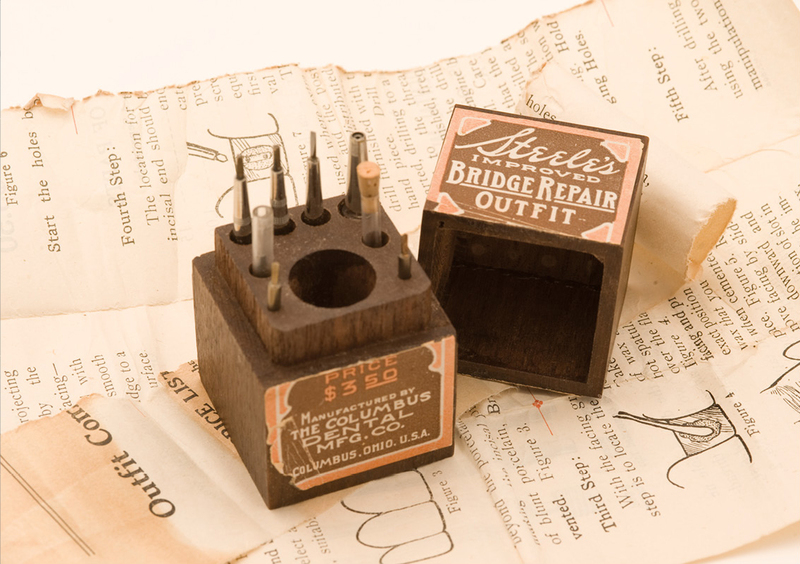 Used for casting purposes to represent the pattern of a prepared portion of a tooth that is being restored. The wax has properties that result in a true casting of the prepared area; from the wax casting a precise mold is made into which gold or other restoration material is poured when fabricating an inlay. 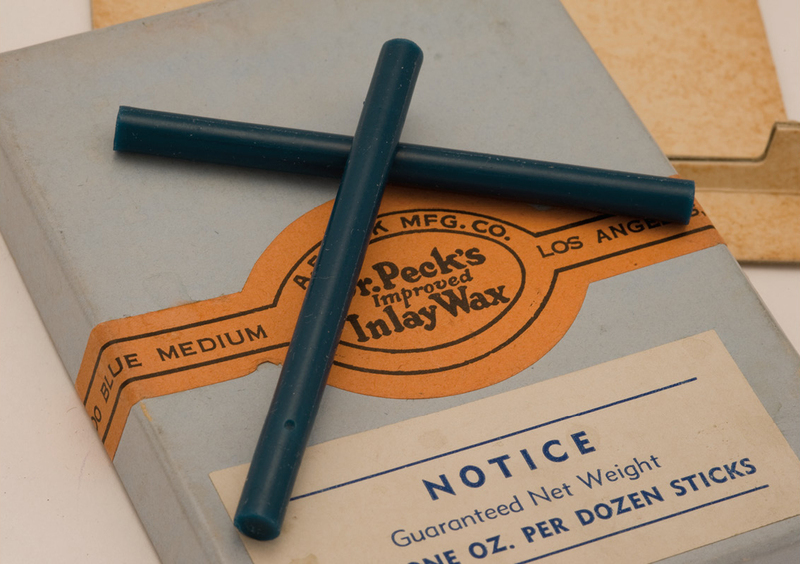 Manufactured by AE Peck Company, Los Angeles. Used for grinding, smoothing, polishing and shaping dentures, crowns and bridge work. 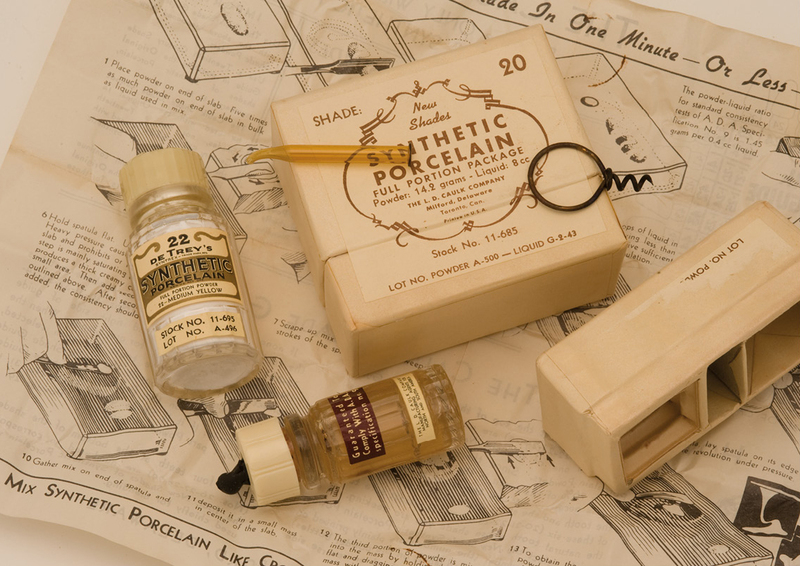 From the lab of Dr. Douglas Kerr, USC graduate, Class of 1926 who practiced in San Francisco until 1989. Used at the dental school for making and pouring of gold leaf during the casting process. 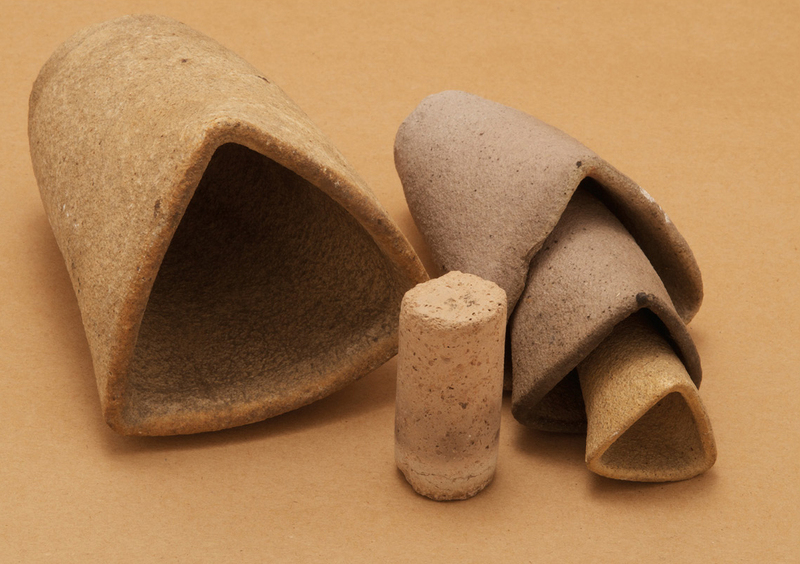 Crucibles are triangular for easier pouring. Gold foil was part of the California State Board Exams until about 1982. 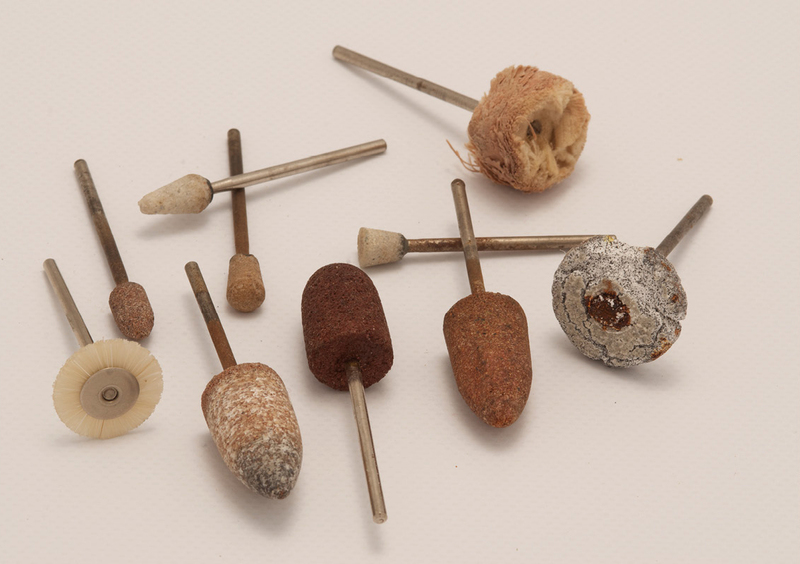 These crucibles and roller were given to the museum in 1979 by Walter L. Morrison, director of physical properties at the dental school. Formula by Dr. A.W. 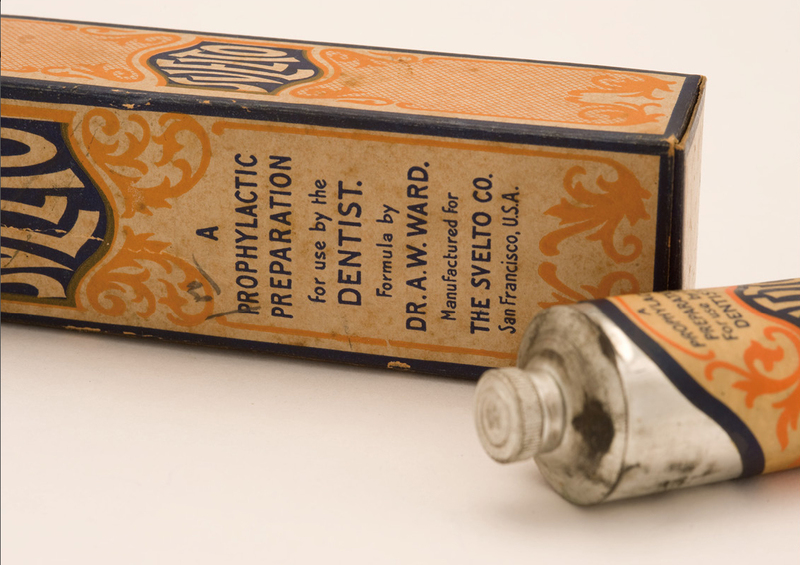 Ward, likely used for treatment of gingival (gum) conditions. Manufactured by the Svelto Company, San Francisco.